On Sale Now! 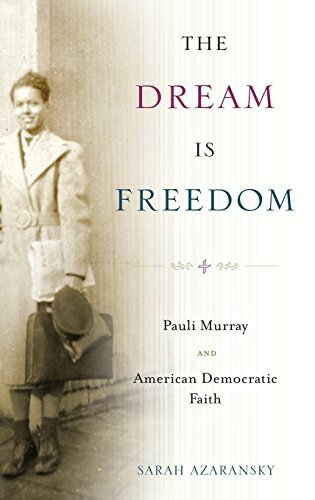 Save 9% on the The Dream Is Freedom: Pauli Murray and American Democratic Faith by Oxford University Press at Translate This Website. MPN: black & white illustrations. Hurry! Limited time offer. Offer valid only while supplies last. Pauli Murray (1910-1985) was a poet, lawyer, activist, and priest, as well as a significant figure in the civil rights and women's movements. Pauli Murray (1910-1985) was a poet, lawyer, activist, and priest, as well as a significant figure in the civil rights and women's movements. Throughout her careers and activism, Murray espoused faith in an American democracy that is partially present and yet to come. In the 1940s Murray was in the vanguard of black activists to use nonviolent direct action. A decade before the Montgomery bus boycott, Murray organized sit-ins of segregated restaurants in Washington DC and was arrested for sitting in the front section of a bus in Virginia. Murray pioneered the category Jane Crow to describe discrimination she experienced as a result of racism and sexism. She used Jane Crow in the 1960s to expand equal protection provisions for African American women. A co-founder of the National Organization of Women, Murray insisted on the interrelation of all human rights. Her professional and personal relationships included major figures in the ongoing struggle for civil rights for all Americans, including Thurgood Marshall and Eleanor Roosevelt. In seminary in the 1970s, Murray developed a black feminist critique of emerging black male and white feminist theologies. After becoming the first African American woman Episcopal priest in 1977, Murray emphasized the particularity of African American women's experiences, while proclaiming a universal message of salvation. The Dream Is Freedom examines Murray's substantial body of published writings as well personal letters, journals, and unpublished manuscripts. Azaransky traces the development of Murray's thought over fifty years, ranging from Murray's theologically rich democratic criticism of the 1930s to her democratically inflected sermons of the 1980s. Pauli Murray was an innovative democratic thinker, who addressed how Americans can recognize differences, signaled the role of history and memory in shaping democratic character, and called for strategic coalition building to make more justice available for more Americans.